'Tis the season for calorie-packed meals, goodies, candy and treats. How does one avoid holiday weight gain and stay slim for the festivities? It's not an easy situation! Most of us want to enjoy the holiday meals but we also want to look good for parties and get-togethers with friends and family. 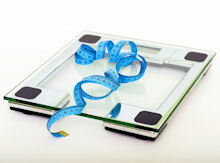 The best strategy is simply to maintain your current weight and stay healthy. Save any plans for losing weight for a New Year's resolution and focus on keeping off additional pounds that have a tendency to creep up on us during Thanksgiving and Christmas. Before you attend any holiday activities, read our guide for how to eat, drink and be merry, while avoiding unwanted weight gain. Before you head off to a holiday party, take the time to eat a healthy snack such as a piece of fruit, low-fat crackers or lean sandwich. You'll be less likely to indulge in the high-calorie foods available at the buffet table. When you fix your plate, do so sparingly but don't rob yourself of your favorite treat. Before going to the buffet table, decide on what desert you feel you must have. If it's there, take one. If you don't see it, do not replace it with something less desirable. If you do, you'll probably consume the same or more calories with less satisfaction. It's just not worth it. Help the hostess by bringing a healthy dish. Consider a vegetable tray or a salad with fat-free mayo. Encourage others to do the same and you'll have plenty to choose from. Rest assured, you won't be the only one watching their calories and your efforts will be appreciated. Drink water with your food. Not punch, soda, eggnog or alcohol. Save the beverages for later and set limits. Bring along your favorite low-calorie diet drink and you won't have to offset those extra calories the next day. Do you love baking but have a tendency to pack on the pounds with goodies and treats in the house? Get organized and buy some decorated cookie tins, bows and Christmas cards and make your own homemade Christmas gifts. Pack the goodies in the tins ahead of time, and store them in the freezer. The temptation will be greatly reduced and they'll be ready to go at a moment's notice. Donate extras to your church or homeless shelter in the spirit of the holiday. Finally, put your goals first and don't let others undermine your efforts. Decide before the party what you will and will not allow yourself to eat. With this in mind, decisions will be much easier to make and may not require a conscious when the time comes, because you've already resolved the issue with yourself. Don't make food the reason for going to any holiday event. Relax, socialize and enjoy the atmosphere. After all, that's what parties are for.